A mezzotint after a portrait of Michael Rysbrack; three-quarter length, with his head turned three-quarters right. He wears a loose bonnet on his shaven head, a shirt open at the neck, and a mantle draped over his shoulder. He leans on an antique bust and holds a pair of dividers. 2nd state. Inscribed below: J: Vanderbank pinx.t 1728 / J: Faber fecit 1734 / Michael Rysbrack sculptor. / Antuerpiæ Natus. / Sold by J Faber at ye Golden head ye South side of Bloomsbury Square. The sheet has been trimmed within the platemark. Michael Rysbrack (1684–1770) was born and trained in Antwerp. Having moved to London in 1720, he soon established himself as the leading sculptor of monumental tombs and portrait busts in England. Among many other projects, he executed several tombs in Westminster Abbey (mainly in collaboration with the architect James Gibbs), including that of Godfrey Kneller (nos 21–4), statues for the gardens of Chiswick House and decorative schemes at Kensington Palace and Houghton Hall. 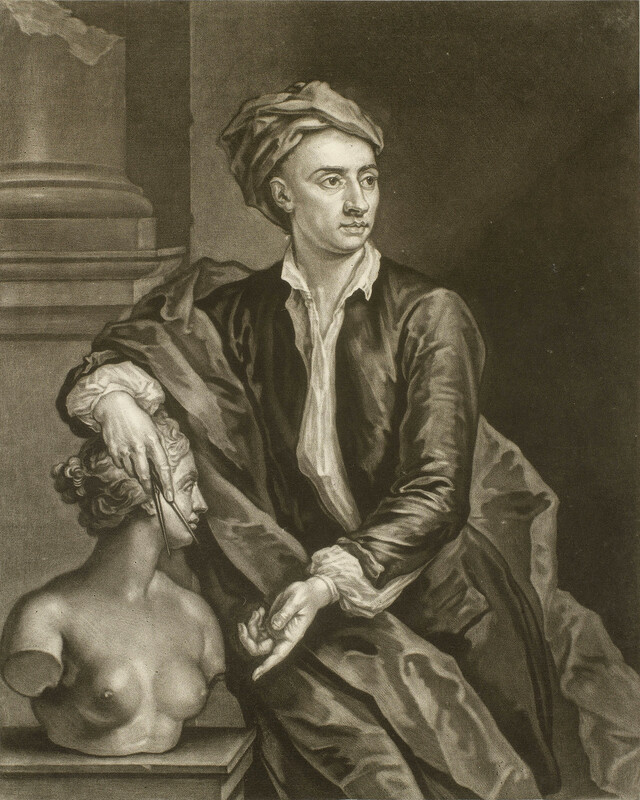 Here Rysbrack is shown resting on and gesturing to a generic classical bust, while holding a pair of dividers of a type that would be used to measure such sculptures for copying. The implication is that he took the Antique as his inspiration and guide, though his informal dress demonstrates that he was also at ease in the modern world – and indeed his own portrait busts could be either faithfully all’antica or strikingly naturalistic. The inscription on the print states that it reproduces a painting of 1728 by John Vanderbank. The painting appears to be that in the collection of the National Portrait Gallery (currently at Beningborough Hall), which depicts Rysbrack with his head in the same position, but which was overpainted at a later date to show him wearing instead a long waistcoat or ‘banyan’, leaning his left arm on a plinth that also supports a classical bust, and holding a scrolled drawing in his left hand. The repainted lower left portion formerly showed Rysbrack’s right hand by his side, holding a porte-crayon, but a partial cleaning of the painting in 1977–9 revealed his right arm resting on a classical bust, exactly as in the print. It may be assumed that Faber’s mezzotint records the original appearance of the whole painting.